What is light? It sounds like a simple question, but it is one that has occupied some of the best scientific minds for centuries. Now, a collaborative study with scientists at the Okinawa Institute of Science and Technology Graduate University (OIST) has added another twist to the story, turning an abstract theory about the quantum properties of magnets into a testable hypothesis about a new kind of light. Ever since Isaac Newton refracted light through prisms in 1672, scientists have been split over whether light is made up of particles or waves. Light seems to travel in straight lines, as would be expected of a particle, but Newton’s experiments have shown it also has frequency and wavelength, like sound waves. Almost 200 years later, the Scottish physicist James Clerk Maxwell supplied one part of the answer, when he realized that light was made up of fluctuating electric and magnetic fields. It was only in the 20thcentury through the work of Einstein, that light was finally understood to be made up of fundamental particles called photons, which act like both particles and waves. This discovery helped inspire the new science of quantum mechanics, which describes the behavior of matter and energy on the atomic and subatomic level. 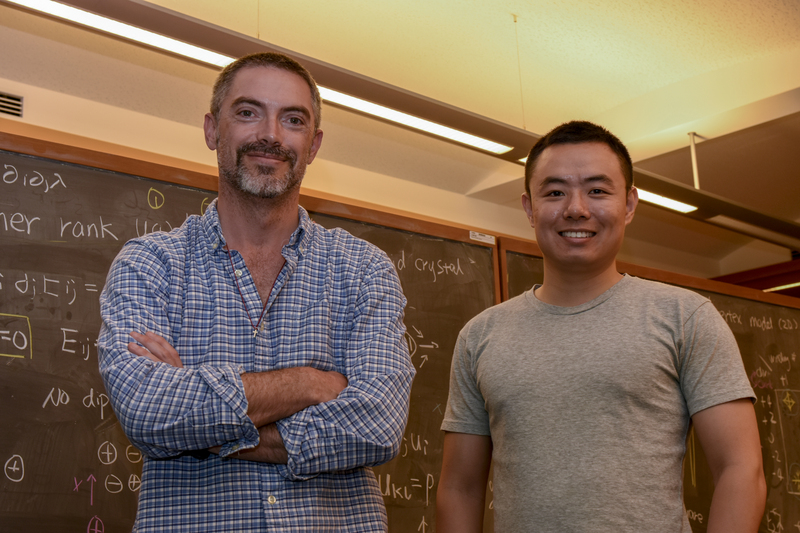 This brings us to OIST Professor Nic Shannon, Han Yan, a PhD student in his Theory of Quantum Matter Unit, and their colleagues in Switzerland and in the US. 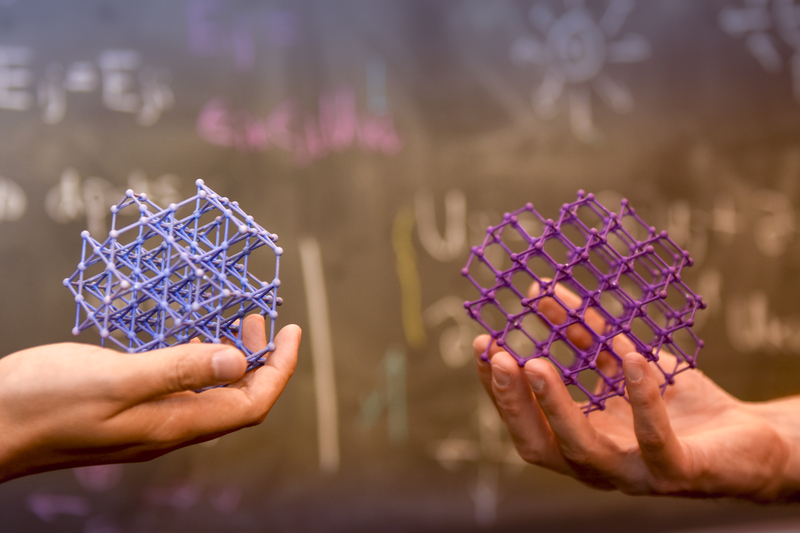 Their recent work centers on a strange family of magnetic systems known as spin ice, which escape all conventional forms of magnetic order and instead open a window on the quantum world. In conventional magnets like the ones on your fridge, magnetic atoms produce a tiny magnetic field and work together to generate the much larger magnetic fields which enable them to “stick” to metal objects. This is possible because the tiny magnetic fields associated with each different atom in the magnet order themselves so that they point in the same direction. In spin ice, however, atoms do not order magnetically, but still work together to produce a magnetic field which fluctuates on the atomic scale. Recently, researchers realized that quantum effects at low temperatures can introduce an emergent electric field in spin ice, with an amazing consequence: Emergent electric and magnetic fields combine to produce magnetic excitations that behave exactly like photons of light. “It behaves like light, but you can’t see it with your eyes,” said Prof Shannon “Imagine the crystal of spin ice is a tiny universe with its own laws of nature, and you are on the outside looking in. How could you figure out what is going on inside. In 2012 Prof. Shannon and his then PhD student Owen Benton proposed a way to detect the light inside a quantum spin ice by bouncing neutrons off the magnetic atoms inside the crystal. They predicted a characteristic signature in how the crystal absorbs the energy of the neutrons, which signals the presence of the emergent electrodynamics of a quantum spin ice. Now, in a paper published in Nature Physics, the authors report that they have observed this signature in a material called praseodymium hafnate (Pr2Hf2O7). Finding the signatures of emergent light in a real material proved very challenging, as it required working at temperatures as low as 50 milikelvin – less than a tenth of a degree above absolute zero - with crystals free of any dirt and imperfections. A research team lead by Dr. Romain Sibille from the Paul Scherrer Institut (PSI) in Switzerland, in collaboration with colleagues at the University of Warwick in the UK, managed to generate a perfect crystal of a quantum spin ice material with which they could finally test the hypothesis. Sibille took this crystal to the European Institut Laue-Langevin (ILL) in Grenoble, France, as well as the Oak Ridge National Laboratory (ORNL) in Tennessee, USA, to use these facilities’ specially-developed neutron spectrometers. 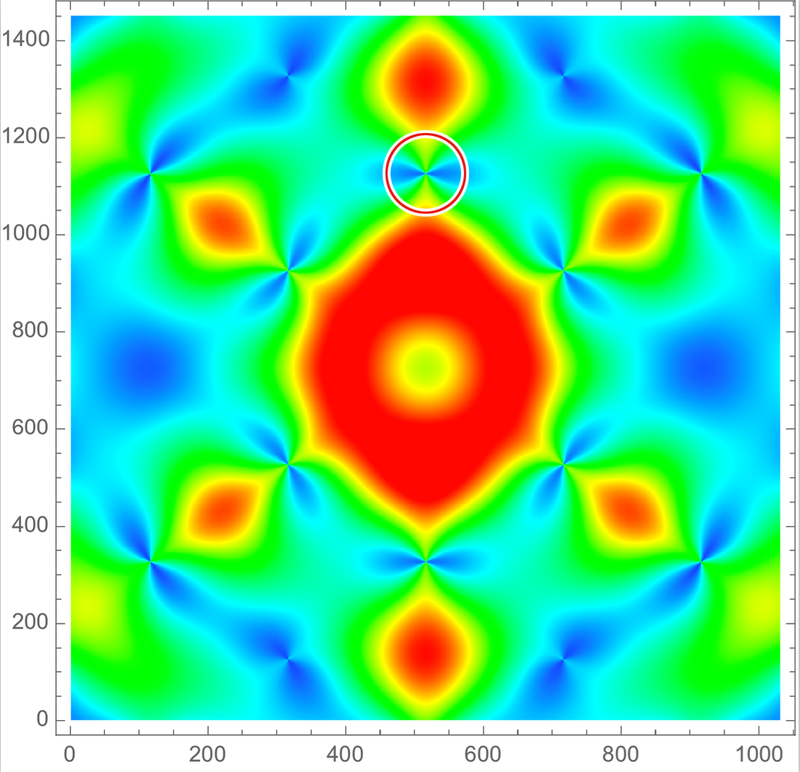 In an extremely challenging experiment, Sibille’s team used an array of 960 supermirrors coated with iron, cobalt, and vanadium alloys that could selectively reflect different types of neutrons - something that his home institution PSI has developed, and used the HYSPEC instrument (ORNL) to obtain a 3D analysis of their reflection patterns. Dr Benton and Prof Shannon’s theory (see picture) bore an uncanny similarity to the experimental energy maps. The graphical representation of neutron reflection displayed so-called pinch points, which are characteristic features of a quantum spin ice. When the spin ice was scanned at low temperatures, the pinch points disappeared in a way that strongly suggested emergent light. Yan worked on the theory and analyzed the experimental data to determine the speed of the emergent light – a modest 3.6m per second, about as fast someone running a marathon in four hours. The photons of normal light – the kind you might sunbathe under – could cover the same distance in less than a thousandth of a second.